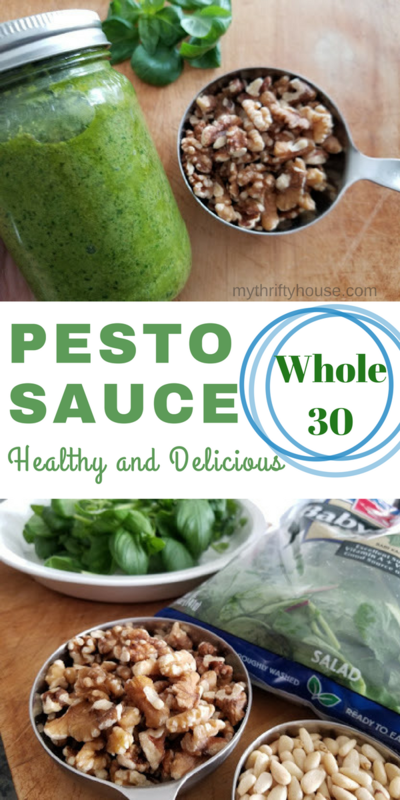 This Whole30 pesto sauce is going to change your foodie world and you won’t even miss the parmesan cheese. 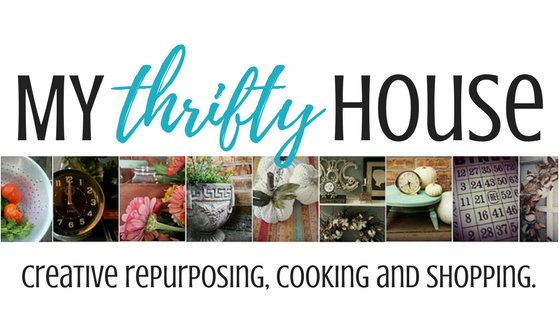 I am constantly looking for ways to revamp my favorite foods and make them Whole30 compliant. 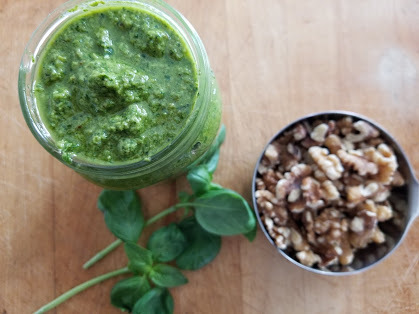 I couldn’t imagine pesto without the cheese but I discovered a secret ingredient that I had never hear of before. 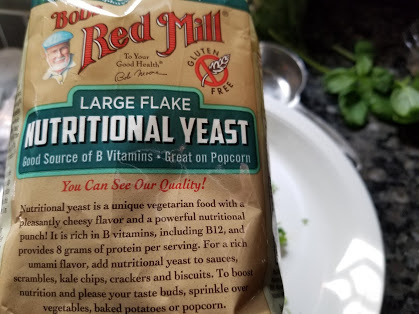 Nutritional yeast! 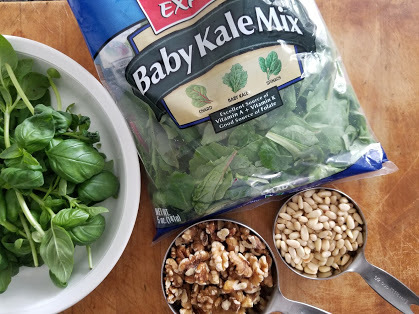 Add walnuts and toasted pine nuts to a food processor and top with the leafy greens and basil. Pulse to break everything up. Add salt, garlic and nutritional yeast. Pulse a few more times to create a paste. Turn food processor on high and slowly drizzle in olive oil until you have a creamy paste. When I am not being Whole30 compliant I would put this pesto on caprese salad, garlic bread, roasted veggies, pasta, fish or chicken. But since I am trying to eat healthy and follow the Whole30 plan I have added it to my zoodles and shrimp and my roasted chicken…..so far. 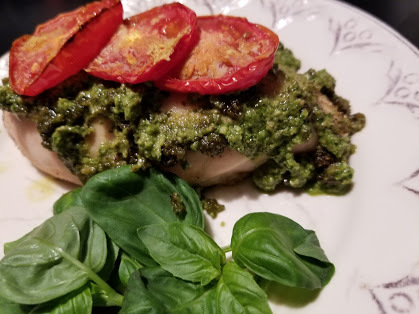 Here is a chicken breast topped with pesto, tomatoes and sprinkled with nutritional yeast. It was over the top delicious for dinner and I used the leftovers to top my salad for lunch the next day. Amazing! 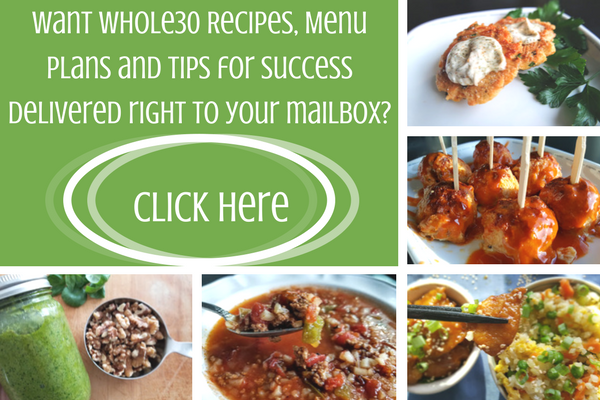 You can find my other Whole30 recipes here but make sure you try the cauliflower fried rice or the stuffed green pepper soup. This entry was posted in Whole30 Challenge.